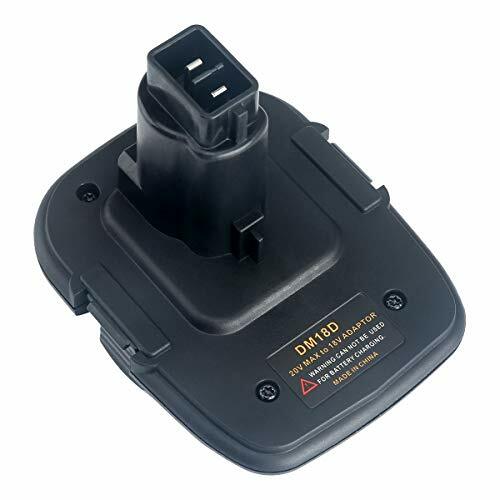 20V MAX Battery Adapter DCA1820/DM18D for Dewalt 18V Tools, Works as Dewalt 18V NiCad NiMh battery DC9096 DC9098 DC9099 DC9091 DC9071 DE9057 DW9096 DW9094 DW9072. Convert Milwaukee 18V Red lithium battery M18 48-11-1860 48-11-1820 48-11-1815 48-11-1828 48-11-1850 to Dewalt 18V NiCad NiMh battery. Convert Dewalt 20V MAX XR Lithium battery DCB180 DCB200 DCB201 DCB203 DCB205 DCB206 DCB205-2 to Dewalt 18V NiCad NiMh battery. Excellent design, Built-in 2-USB Port design for charging low-power electronic products, like smart phone, iPad, smartwatch. 30-day money back and 12 months limited warranty! Comply with FCC RoHS and CE security testing standards. View More In Battery Packs. If you have any questions about this product by Lasica, contact us by completing and submitting the form below. If you are looking for a specif part number, please include it with your message.